The recent Fed hints at ending QE means rising interest rates. It also means big changes in the markets. Here are several ETFs to protect yourself and invest in as interest rates rise. This was done to spur economic growth and hiring. It wasn’t going to last forever, either, and the Fed is already planning the unwind. So far the Fed has hinted at tapering its monthly bond buying program and eventually ending it. This won’t happen until the Fed believes the economy is strong enough to grow on higher rates. 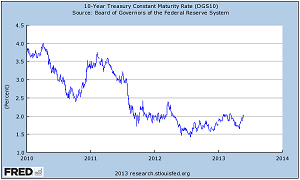 If QE lowered interest rates, a slow tapering by the Fed should have the opposite effect. Eventually rates will normalize as the QE bond buying comes to an end. The whole process will take time and would negatively affect some investments. We’ve already seen a glimpse of what might happen when it does. All this QE produced historically low rates. It’s been great for borrowers, but it’s pushed investors into alternative assets like high yield dividend stocks, REITs, MLPs, and corporate and junk bonds. In turn, it pushed the prices on these assets higher – maybe too high thanks to the ultra low rates. Right now the bond market says rates should be higher. That means either higher inflation, a higher cost of borrowing, or the Fed made changes. We know the Fed hasn’t done anything yet and inflation is still low. That leaves higher borrowing costs. Which makes sense if the economy is growing. An improving economy means businesses borrow more for growth, expansion, and hiring. A rising demand in borrowing naturally pushes the cost to borrow i.e. interest rates higher. This is a good sign of a growing economy. Eventually rising interest rates will be high enough to make bonds more attractive again. We’re not there yet, so consider shorter term bond investments over the riskier long term bond funds. Stick with that until bond yields compete with high yield dividend stocks and other bond alternatives for investor dollars. It’s these bond alternatives that will be hit hardest. We’ve seen signs of that already in May with utilities and telecom stocks down over 8% while the 10-year Treasury yields hit one year highs. Any sell off in these slow growth, high yield stocks will be an opportunity in the future. The best way to play it is toss several best of breed stocks or ETFs in a watch list and buy once prices hit bottom. So if you believe the economy will continue to improve and the Fed will start tapering QE, the next few months might be a good time to make some changes. The place to focus is in areas that aren’t affected by rate changes or that benefit from rising interest rates. Below are the top results from ETF screens based on three sectors that should benefit from higher interest rates. Cyclical stocks do great when the economy is growing and poorly when the economy slows. These are the same companies that have done well recently and will continue to do so as the economy improves. These are the car makers, retailers, restaurants, and more that benefit when people have extra money to spend. Banks make money many ways. The biggest is from lending money at higher rates than what it pays on deposits. Since banks profit from a higher spread between short and long-term rates, rising rates will boost profits. Insurance companies make money two ways – bring in more premiums than claims are paid or by investing the “float”. The float is money that will eventually be paid out in claims. As interest rates rise, insurance companies can reinvest the float at higher rates and increased profits. When rates rise, it won’t happen all at once. Remember it took three years to hit all time lows. Unless the economy starts growing incredibly fast, it should take just as long to move higher. Now is good time to make some minor adjustments for the future and limit your risk at the same time.